STEPHANOPOULOS: Good morning, and welcome to "This Week." SEN. HARRY REID, D-NEV.: The clock is ticking. PRESIDENT BARACK OBAMA: Nobody gets 100 percent of what they want. REP. JOHN A. BOEHNER, R-OHIO, HOUSE SPEAKER: Not the outcome that I wanted, but it was the will of the House. STEPHANOPOULOS: After Speaker Boehner's stinging defeat, is there any way to salvage a deal and strengthen our economy? BOEHNER: How we get there, God only knows. OBAMA: I actually still think we can get it done. STEPHANOPOULOS: Defiance from the NRA. WAYNE LAPIERRE, CEO, NRA: Blood-soaked films out there. Violent video games. The national media machine. The only thing that stops a bad guy with a gun is a good guy with a gun. STEPHANOPOULOS: And a new pick for secretary of state. Our headliner this morning, the NRA's new point person on school shootings, Asa Hutchinson. Then the Senate debate with Republican Johnny Isakson and Democrat Amy Klobuchar. Plus, our powerhouse roundtable with Newark Mayor Cory Booker, anti-tax activist and NRA board member Grover Norquist, Peggy Noonan of the Wall Street Journal, Katrina Vanden Heuvel of The Nation, and ABC's own Matthew Dowd. STEPHANOPOULOS: Hello, again. The president and Congress are off for Christmas, fleeing a Capitol filled with partisan rancor and political dysfunction. Fiscal cliff talks have completely collapsed. Questions about the president's new national security team have forced him to announce the appointments piecemeal, and the National Rifle Association's first response to last week's tragedy in Newtown has provoked a fierce debate. We'll cover all that today, starting with the NRA's choice to lead a national effort to protect schools, former congressman and top official at the Homeland Security Department, Asa Hutchinson. Good morning, Mr. Hutchinson. Thanks for joining us this morning. You emphasized at the press conference Friday that you will be independent. But as you begin your effort, this national school shield initiative, I wonder if you agree with the analysis of the problem laid out by Wayne LaPierre. He says Americans have to face this truth. Take a look. LAPIERRE: Politicians pass laws for gun-free school zones, and in doing so, they tell every insane killer in America that schools are the safest place to inflict maximum mayhem with minimum risk. STEPHANOPOULOS: Do you personally believe, Congressman, that gun-free school zones have been invitations to mayhem, and the only way to stop a bad guy with a gun is a good guy with a gun? HUTCHINSON: Well, I think that when you look at school safety, you've got to put armed guards into the equation. I've made it clear that it should not be a mandatory law, that every school has this. There should be local choice, but absolutely, I believe that protecting our children with an armed guard who is trained is an important part of the equation. We have two-thirds of our schools -- or excuse me, one-third of our schools in America right now with an armed off-duty police officer or a resource officer. If you have a choice of sending your child to a school that has that type of protection versus not, I think most people in America would say, let's go to what would be the school that invests in that type of safety and security. STEPHANOPOULOS: So when Governor Chris Christie and others say you don't want to turn schools into an armed camp for kids, you dismiss that criticism? HUTCHINSON: Well, I do. Let's compare this back to the federal air marshal program on airplanes. There was intense debate that on airplanes, guns have no place, and yet we have a federal air marshal program that I helped to oversee, and which has provided a deterrent. It has increased the safety of the airlines, and it's not like it's an armed camp when you go on the airlines. It's a very discreet use of armed guards that has a presence there to protect America. Are our children less important to protect than our air transportation? I don't think so. So I think it's a very reasonable approach. STEPHANOPOULOS: You say it should be part of the solution. I guess one of the questions, should it be a complement to other efforts or a substitute for other efforts? Even strong NRA supporters, like Senator Joe Manchin of West Virginia, have argued that everything should be on the table. He has got a big piece in the Washington Post today. I want to read part of it. He says, "if you think the problem of mass violence in our country is about just guns, you're wrong. If you think it's about just an entertainment industry that markets violence to kids, you're wrong. If you think it's just about insufficient security in our schools, you're wrong. If you think it's just about the lack of mental health services for troubled young people and adults, you're wrong. We need to address all of them." HUTCHINSON: Well, I think you need to have a broader debate. Part of that debate that I'm focused on is the safety in the schools, but absolutely, you have a mental health issue and component to this. I would make the point when it comes to more restrictions on firearms in our society, that if we go down that path, we're going to miss the focal point of providing safety. I think that is really the wrong debate to have. We've had an assault weapon ban previous in our history. You had school violence continue. It's not restricted to weapons. You think of Timothy McVeigh, he used fertilizer to conduct his mayhem. So I would rather focus on the safety side, what can we do to better secure and protect our children at school. STEPHANOPOULOS: But then are you saying that the gun control debate shouldn't be part of this at all? HUTCHINSON: Well, it's -- sure, I mean, Congress is going to debate this. I just think it's not part of the ultimate solution on this. When you think about bringing together nationwide experts to provide some solutions for the schools, that really is what I think is most important. Right now you've got states introducing laws that would mandate teachers to carry guns. You're having a whole potpourri of solutions, and I think if we get our experts together that could provide some things, that's a better direction to go that's thoughtful, that provides some solutions in terms of safety. STEPHANOPOULOS: So you don't think these states should mandate teachers carrying guns? HUTCHINSON: No, I -- you think about a teacher. They go to educate these young people. They're not there to carry concealed weapons and provide that protection. They have to fulfill that role, and they do it very bravely sometimes, but I think it's much better to have a retired police officer or a retired military person who's been trained for sensitive environments that can provide the protection, an added level of security and other security measures, not just that. Let the teachers teach and let others protect. STEPHANOPOULOS: I think that some people would agree with the idea of having armed security guards in the school if the community wanted it, but they would also say that at the same time, we have to have some commonsense restrictions on guns. You shouldn't have high capacity magazines that can shoot 30 bullets. Senator Manchin said that background checks for people who buy guns at gun shows, not just from registered dealers. What's wrong with those ideas? HUTCHINSON: I think it takes away -- it -- whenever you pass those kind of laws, you think, well, we've done something. We've somehow made our children more safe, so you go home. I don't think the job is really accomplished anything if you take that approach. STEPHANOPOULOS: But why not do both? HUTCHINSON: Because the children will still be unsafe. STEPHANOPOULOS: Why not do what you're recommending and have gun control? HUTCHINSON: Well, I don't think that's the solution. Congress can debate that. I will focus my energies not on the political side, but simply on the technical, security and safety side, and I think that that's going to accomplish more in helping our schools protect the children than anything else we can do. STEPHANOPOULOS: Finally, let's bring this back to the children and those victims in Newtown, because some of the families have now begun to speak out. I want to show Mark and Jacqueline Barden. Their little daughter -- their daughter was killed in Newtown, and here's what they had to say to Katie Couric. MARK BARDEN: My daughter Natalie was interested in asking him if he could pass some kind of legislation so that the only people that had guns were military personnel and law enforcement, and if people needed guns for sport that they could go to a range and the guns would have to stay there. That was my 10-year-old daughter. That was all her own original thought. UNIDENTIFIED FEMALE: She just doesn't understand how somebody could have access to walk into a school with this stuff. STEPHANOPOULOS: I apologize. It was their son, but what do you say to the Barden family? HUTCHINSON: I just say my heart goes out for you. It is an incredible grieving time for them, for the city of Newtown and our nation, and we look forward to getting their thoughts, as well as many others as we develop what we all want to do, which is better safety programs. We want to protect our children, and that's what we have in common together. Let's turn now to our Senate debate, with Democrat Amy Klobuchar of Minnesota and Republican Johnny Isakson of Georgia. And Senator Klobuchar, let me begin with you. You just heard Congressman Hutchinson. What's your response to the gun debate right now? KLOBUCHAR: Well, you know, George, I'm a former prosecutor, and I oversaw efforts with our school safety with 25 major high schools, and I have to say that this was part of the equation that we have to look at this just as we look at all issues and see if there's other things we can do to help local schools with school safety. But we have to go beyond that, because we know we can't have an armed guard at every doorway, at every classroom. And so you have to look at the fact that a lot of these mass shootings have taken place in houses of worship, they've taken place in movie theaters. And so looking into the larger debate that Senator Manchin and other more conservative senators who have been supported by the NRA in the past have pointed out, look at things like high capacity magazines. Putting some limits on that could be part of the solution, but not the only solution. The background checks, my Republican sheriff was in to see me, we talked the fact that 19 states have only submitted less than a hundred records on mental illness, on criminal backgrounds. That's what we're talking about here is looking at making sure we go after what seems to be the common thread through these mass shootings, which is people, the severe mental illnesses getting hold of guns and at some points assault weapons, guns that literally can shoot three to 11 bullets into one child which is what we saw in Newtown. And I will say in what we saw in Newtown is one thing. But I also understand in my state, which is a state that loves our hunting and fishing, that we have to do this in a way that isn't going to take the guns out of the hands of our hunters, out of the hands of my uncle and his deer stand. And I don't think that's going to happen if we look at these commonsense solutions but we have an opportunity now to move forward and get all these ideas on the table. And as long as we move quickly, get the ideas together, we're going to have hearings in the judiciary committee I think we have an community. STEPHANOPOULOS: Senator Isakson, are you willing to put those ideas on the table? ISAKSON: Well, Miss Klobuchar just made a very good remark about mental health. That is the common thread that's run through all of these school shootings. When I was in the Georgia state senate in 1995 I was part of the congress committee that wrote the background check law that's available in Georgia today, but she's right very few of these mental health registries actually work so we have got to improve that to make sure that common thread no longer exists. STEPHANOPOULOS: And -- but are you willing to consider the other proposals that she just discussed: broader background check, a federal background check, some restrictions on high-capacity magazines? ISAKSON: I'm happy for a commission to look into every aspect. I want to remind you, George, in fact, I think you were in the White House in '94 when the assault weapon ban passed and Columbine took place in 1999, five years into that ban which is now expired. So bans alone don't solve the problem. KLOBUCHAR: Well, when you look at what happened in Colorado where we had their high-capacity magazine and you look at what happened in Newtown, both of those situations -- and, of course, it's not going to be the same in every situation in every tragedy, but both of those involved those types of guns. And if we can do something to limit them and if we can get some bipartisan agreement I think we can move forward on that. We had a shooting in Minnesota, a small business, you know, six people gunned down with an employee that clearly had a mental illness, should not have had access to those guns. Every situation is different but when you look at some of the last few shootings they did involve those kinds of high-capacity magazines and I think that has to be part of the equation in addition to looking at the background checks. The staff that I always remember is -- came from the uncle of a little girl that was killed in Newtown. And that uncle who lives in Minnesota said that there were once ten girls in the Girl Scout troop of his niece and now there's only five. STEPHANOPOULOS: Let me turn now to the fiscal cliff discussion. We saw those talks between the House Speaker and the President Obama collapse this week. All eyes now on the senate. And I want to show what the president called for before he left for his Christmas holiday on Friday afternoon. Here's the President. OBAMA: All of us, every single one of us, agrees that tax rates shouldn't go up or the other 98 percent of Americans. So there is absolutely no reason, none, not to protect these Americans from a tax hike. STEPHANOPOULOS: Senator Isakson, he says that every Republican, every Democrat in Washington says everyone earning under $250,000 should not get a tax hike. So he wants to put that on the floor along with an extension of unemployment benefits and some relief from this sequester that's supposed to hit January 1. Any chance you could support that, Senator Isakson? ISAKSON: Well, I felt like the House should have gone ahead and passed Speaker Boehner's bill because it addressed the subject and we'd still be in negotiation. And the president's statement is right, no one wants taxes to go up on the middle class. I don't want them to go up on anybody, but I'm not in the majority in the United States Senate and he's the president of the United States. If we get down to the end of this year and the only choice we have is to save taxes going up on the middle class, then I would support that, but I wish we would have a comprehensive bill that dealt with spending, dealt with entitlements and dealt with taxes altogether. That's really what we ought to do. STEPHANOPOULOS: But is that still realistic with time so short right now? ISAKSON: It's not realistic, but it was realistic December 1 when we had a lot of time. Unfortunately we killed a lot of time politically while the clock was ticking. It's time for us to get down to work and do the people's business. STEPHANOPOULOS: Well, Senator Klobuchar, you just heard Senator Isakson say he would support a bill like that if it came to the floor even though it's not his first preference. Is that what you expect your leader, Senator Reid, to bring to the floor? KLOBUCHAR: Well, we have already passed that in the senate, as you know, George, for keeping the tax cuts in place for the middle class, people making under $250,000 a year. And as you know, if we go back to the Clinton levels for people making over $250,000 we literally save a trillion dollars in ten years. But I will say, Johnny Isakson is a guy I like a lot. And you can see his willingness to talk about things in the middle is what we need in Washington. And the main thing that needs to happen here is that Speaker Boehner and the House of Representatives have to come back to Washington. The Senate is coming back on December 27th. I think, you know, most members are used to spending that Christmas to New Year's at home in their home states. It is time to get back to the table. And I hope if anyone sees these representatives from the House in line shopping or getting their Christmas turkey they wish them a Merry Christmas, they're civil, and then say go back to the table, not your own table, the table in Washington, because middle class people shouldn't have their taxes go up an average of $2000 a year and we also should start making some meaningful reform on the debt. And I would love to see a bigger deal. I'd like nothing more and there's always miracles. It's Christmas, "Miracle on 34th Street." KLOBUCHAR: ...miracle on Pennsylvania Avenue. STEPHANOPOULOS: That might take a miracle. But Senator Isakson, you've been pretty confident all year long this fiscal cliff would not -- we wouldn't go off the cliff, that taxes would not go up on everyone, the sequester would not kick in. Do you still have that confidence? Do you think it's a greater possibility right now? ISAKSON: I sold houses for 33 years, George, I'm an eternal optimist. But time is running out. And the truth of the matter is if we do fall off the cliff after the president is inaugurated he'll come back propose just what he proposed yesterday in leaving Washington and we'll end up adopting it, but why should we put the markets in such turmoil and the people in such misunderstanding or lack of confidence. Why not go ahead and act now? STEPHANOPOULOS: OK, that sounds like both senators want some action there. Finally on the president's national security team, and I want to start with you, Senator Isakson, because you are on the Senate foreign relations committee. Senator Kerry, the president's pick for Secretary of State, but several of your colleagues have raised questions about the possibility of Chuck Hagel, your former colleague from Nebraska being Secretary of Defense. John Cornyn has said he would oppose that nomination because of Senator Hagel's views on Israel and other issues. Would you have any problem with that nomination of Senator Hagel or for that matter Senator Kerry? ISAKSON: Well, I have no problem at all with John Kerry. I've served with him for four years on the foreign relations committee. He's done outstanding work, particularly in the Middle East. He's been a great envoy and a great diplomat for the United States and I think he'll do a great job as Secretary of State. As far as Mr. Hagel is concerned, I served with him in the Senate, but he hasn't been nominated yet, George, and I'll reserve any judgment until after the hearings we have on confirmation if in fat he is nominated. 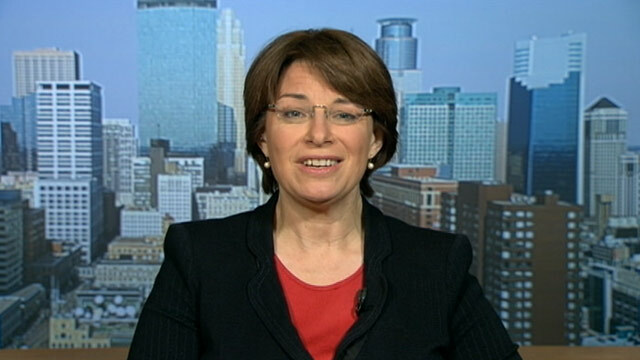 STEPHANOPOULOS: Senator Klobuchar, on Senator Hagel, even the top Democrat on the House foreign affairs committee, Eliot Engel has said he has severe issues with the possibility of a Secretary Hagel because of what he called his endemic hostility towards Israel. Do you share those concerns? KLOBUCHAR: Well, again, I would see what happens with these hearings. I've intersected a brief period of time with Senator Hagel. He has a lot of respect. We'd see who the president nominates. And I did want to say John Kerry awarded the Purple Heart in Vietnam, someone who has led the foreign relations committee, someone who has shown the ability to get tough things done like the nuclear arms treaty a few years back, really will follow in the footsteps of a superb Secretary of State Hillary Clinton. And the president has put together in the past a few good national security team. I'm sure he'll do so again. STEPHANOPOULOS: Senators, thanks very much for your time this morning. Have a great holiday. Good luck solving this problem when we come back on Thursday. KLOBUCHAR: Well, we'll see you back in Washington soon. Merry Christmas, Johnny. STEPHANOPOULOS: And we'll right back with our powerhouse roundtable. STEPHANOPOULOS: Our powerhouse roundtable is coming right up. What is Grover Norquist telling Congress now about the fiscal cliff? How would Newark Mayor Cory Booker handle it if he were in the Senate? And everyone weighs in on the gun debate after the tragedy in Newtown and that blistering press conference from the NRA. We'll be right back. OBAMA: It wasn't until I was 11 years old that I recall even learning what a U.S. senator was, and the person who fascinated me most was this man of Japanese descent, with one arm, full of dignity and grace. And so to see this man, this senator, this powerful, accomplished person, who was not a central cast, the way he commanded the respect of an entire nation, I think it hinted to me what might be possible in my own life. STEPHANOPOULOS: President Obama remembering Senator Daniel Inouye on Friday. A rare moment in Washington where Democrats and Republicans came together to honor that American hero. We're going to talk about the rest of the week's politics now on our roundtable, joined by Peggy Noonan of the Wall Street Journal; Mayor Cory Booker of Newark; ABC political analyst Matthew Dowd. Also Grover Norquist of Americans for Tax Reform, also an NRA board member, and Katrina Vanden Heuvel, publisher and editor of The Nation. You also write a weekly column for Washingtonpost.com. And let's begin with this fiscal cliff, Peggy. Let me bring to you the Wall Street Journal yesterday, your newspaper, had a fascinating blow-by-blow of how the speaker's plan B collapsed on Thursday after the talks with the president collapsed, as well. In your view, what went wrong here? It seemed like there were so many wrong turns, and an absolute collapse. NOONAN: Yes, it has been a bit of a debacle -- I think you can actually say. I think it was a very -- I think the speaker has been in an impossible situation, and I think that he tried to put forward a plan that just might save things a little, and it didn't work. I do think part of the story, which is -- doesn't get enough attention from folks like us is that the president has been a little Michael Corleone towards the Republicans in the negotiations with Boehner, and that essentially he is saying when Boehner says I'll give you this, I'll give you this, I think the president is more or less saying, this is what I'll give you, nothing. He doesn't want to do spending. The Republicans are willing to bend on taxes, but spending is where the real action is, and I really do think that this may go up to the end and might go over. STEPHANOPOULOS: I think that's very possible. I think, Matthew Dowd, I think one of the things the White House would argue is that they did the spending cuts last year. He offered about $600 billion this time around, but no question, the president taking a firm line in these negotiations. But speaking of the impossible situation that Peggy just mentioned, it does appear that no matter what Speaker Boehner negotiates with the president, it is something that cannot get through his conference. MATTHEW DOWD, ABC NEWS: Well, first, merry Christmas to you and your family and everybody here. Happy holidays to all that, and I have a sticker that my daughter made me wear, Santa Claus until Santa Claus comes, so just better be nice and not naughty. I mean, I think this demonstrates that this fiscal cliff -- and I know we're going to talk about the whole debate over hometown -- or Newtown -- which I actually think is -- encompasses a problem that is systemic in this country right now, is that both sides, both the far left and the far right stake out dogma and stake out purity positions, and it doesn't allow the people in the middle that actually have to gain the yards on the field to get the job done that they need to get done, and both sides I think stick to a dogma that's really not true and really the American public doesn't believe. Republicans want to stick to a dogma saying that you can't raise taxes, and that's not going to fix the problem, and Democrats and many on the far left stick to the thing you can't do anything to fix entitlements, and the only way you can really fix this fiscal problem that exists, which is, even if you fix this fiscal cliff, we still have a fiscal problem, is to go in the middle and argue over both tax increases -- which everybody knows needs to go up in order to fix the problem -- and spending cuts and entitlement reform. STEPHANOPOULOS: The middle exists in the country, it may not exist in Washington. But on your point about dogma, Grover Norquist, Americans for Tax Reform, of course you popularized the no-tax pledge for many years. But on this plan by the speaker, which would have allowed taxes to go up on those making over $1 million a year, your group said this wasn't a tax increase, and that still wasn't good enough for a lot of House Republicans. STEPHANOPOULOS: No support in the Senate, no support from the president. It's not going anywhere. NORQUIST: But the Democrats in the Senate haven't done a budget in three, four years, haven't put anything forward that deals with entitlements. There's one and only one plan that has actually been passed by one House. The president hasn't put anything forward that fixes entitlements. His plan, his budget, if you continue it out, you know, to 2040, 2050, takes you to 38 percent of GDP and the economy collapses. NORQUIST: And the president is only one part. The Republicans actually passed a budget that -- not a budget, not just a budget, but a budget plan that goes out through the years, gives you entitlement reform, gives you pro-growth tax reform, doesn't raise taxes. You don't have to raise taxes to balance the budget. The left wants to raise taxes, but you don't have to, to balance the budget and take the debt down. So they have got a plan. They've passed it, and they got re-elected having done that. The Senate got re-elected because they never voted on anything. It's the only way they were able to get re-elected. And so they haven't even put something forward, and the president's plan was an outline that the House and the Senate voted against. You can't argue you have a mandate when your own party voted against your budget. STEPHANOPOULOS: Katrina, respond to that. KATRINA VANDEN HEUVEL, THE NATION: George, there was an election. And Americans voted very clearly for a sense of different priorities than Grover Norquist has stood for. One was that the richest in this country pay their fair share, and I also resist very strongly Matthew Dowd, with the good Band-Aid and all, but what he said about the left and the right. Because it's not just the left, it's not just progressives, it's Americans in survey after survey support Social Security, Medicare. And to take Social Security away from widowed women when the richest are paying the lowest taxes in modern memory is not about being a compassionate country in this time of season. It is about a country that's lost its way. STEPHANOPOULOS: So you are saying just go over off the cliff at this point. STEPHANOPOULOS: -- that may be, but on January 2nd, when everyone's taxes go up, it may not feel like it's a manufactured media event. It may feel real to an awful lot of Americans. BOOKER: But that's the point, and this is what folks don't understand. What I think is she's actually making a very strong point here, is we're taking this -- this incredible mallet and about to smash America, and the people that are going to suffer for that are the people in my community who want to try to go to college who are going to lose out on avenues to do that, because that's what this sequestration will mean. About the FBI agents that will be cut that are protecting our borders, protecting our nation from challenges. People are going to be cut out of programs that support the poorest Americans getting access to healthy food and a strong strength for their children. And this is really what bothers me right now, is there is a way forward through this. STEPHANOPOULOS: And there is a way forward, and, Peggy, I want to bring this back to you, but it does seem, if you look at the consolation of forces in Washington right now, that the only way that something is actually going to get to the president's desk is if House Speaker John Boehner agrees to let there be a vote on something that will get Democratic votes and Republican votes, and probably shear off his most conservative members. NOONAN: That may be true. That may be where this whole thing ends, but I think it still has to be made, this point, that everybody, Republicans included on Capitol Hill, they all know there's going to be a tax increase. They know it. BOOKER: The president has suggested fiscal sanity. The president, as part of his plan, has spending cuts. The reality is that there's been compromise, and there has been give, and we have a way forward not to hurt American people. And what we're driving ourselves to is a real fiscal cliff. There will be thousands of dollars cut for families who are barely making their mortgage payments or are barely holding on. And so to have a ridiculous debate right now, when really real American families are in the lurch now, are going to be suffering in ways that most in Washington don't seem to understand. STEPHANOPOULOS: So what's the way out? DOWD: The way out ultimately has to be right down the middle. Right down the middle, where there's a series of compromises. Everything -- every good leadership is about both conservative ideas and progressive ideas. We have to move forward, we have to move forward into the future, and we also have to conserve the ideas and thoughts that are actually helpful to the country. DOWD: You cannot call for a sacrifice by average Americans and say we are not going to raise taxes on the wealth. VANDEN HEUVEL: I want to make a deal with Grover. I want to make a deal with Grover. There are fair share ways to reduce the deficit. Short-term deficit isn't the main problem we have, but the Republicans last week voted to keep the defense budget out of the cuts, out of the sequester. I would like to say to Mr. Norquist that the left and right, citizens of conscious and sanity, should agree that the most bloated, wasteful, fraudulent piece of our budget is the defense budget, and we should make cuts in that. We should do a financial transaction tax. We should tackle the subsidies to big oil, big pharma. Those are the drivers of the problems of our economy. Social Security shouldn't -- by law cannot contribute to the federal deficit, so it shouldn't even be in the same sentence with debt. NORQUIST: While we talk about imaginary things that might happen in the future, on January 1st and 2nd, we have the very real thing that nobody here has talked about, and people at home know -- they haven't been hearing about it from the press, and that is, there is a series of tax increases to pay for Obamacare that start January 2nd in this country. And the president has taken those off the table. This is not part of the sequester or the fiscal cliff. STEPHANOPOULOS: All passed by Congress and signed into law by the president. NORQUIST: Average Americans who are very sick are paying $2 billion to $3 billion more in taxes to pay for Obamacare. These are tax increases on the middle class, put there by Obama. He wants you to talk about taxing the rich because he's busy socking it to the middle class. BOOKER: There is a luxury of a debate here that Washington may have, that folks like me on the ground in cities all across America don't have. I've got to balance budgets. I can't get into philosophical debates. What we've had to do in Newark is we had to cut our workforce almost 25 percent. We had to cut government spending almost 20 percent, but you know what? We've had to raise taxes as well, because it's a pragmatic way forward. But this is what I learned in Newark. If you start cutting programs for the poor, you start to inflict a damage not on the poor, but on yourself, because in this country -- it's the truth -- it's easier to raise strong children than to heal broken men. We wonder why we have such expensive prison systems, why we have such high medical costs, it's because we're not making the front-end investments. And if this country is going to cut investments in colleges and universities, cut programs that are going to give people access to college, we may get a short-term benefit from that, but we're going to lose the long-term gain. STEPHANOPOULOS: I think our table today is reflecting why Congress might be having a lot of trouble, as well. Let's turn on to the other big debate of the week coming out of the tragedy in Newtown, the debate over how to confront violence in schools and across the country. We saw that press conference by Wayne LaPierre on Friday. The National Rifle Association executive vice president, and boy, drew a fierce reaction. Look at the covers of the two New York tabloids, the "Daily News" and "The New York Post." "Daily News," craziest man on earth. "New York Post," gun nut. Grover, you are a member of the board of the NRA, and I know you agree with the positions of the organization, but do you think that performance helped your cause on Friday? STEPHANOPOULOS: The presentation may have mattered. NORQUIST: Well, it may have, but I think this is a very interesting point, that the idea actually is one that has a bipartisan background. I know that the leadership of the NRA was just over in Israel, actually, meeting with the people who do the training for the people who carry guns in schools to protect children. These are -- this is an idea that seems fairly reasonable. And when presented by Bill Clinton, you know, New Yorkers didn't attack it, and so I think part of what we're seeing, I think, sadly is again, Rahm Emanuel's comment never let a good crisis go to waste. And the gun control advocates for a long time have jumped on every tragedy and tried to exploit it in unhelpful ways. I think the NRA did well to hold off for a while in responding. NOONAN: I take what you say about the mood of it. Here's something that I think was important. The first half of the Wayne LaPierre statement, in which he passionately scored our culture -- the video games, the movies, the whole thing. We've all been through this for 25 years, and yet we cannot say it enough. Our culture is helping to make unstable people sick and dangerous. It does make a contribution. He was right to say it, I was delighted to hear it. I am for the banning of the extended magazines or extended clips, I can never figure out exactly how to say that, but I know what it is. I don't think there's any reason to have 33 bullets in a killing machine that you can take into a place like a school. I think there are simple and discreet measures that can be taken on Capitol Hill, such as the banning of the magazines, that could actually be helpful for our country and would give us a feeling of relief. NOONAN: One, small, discrete thing is done. BOOKER: I don't know if anybody here has seen somebody shot – I have. I don't know if anybody here has had to put their hand in somebody's chest and try to stop the bleeding so somebody doesn't die, I have. And the what frustrates me about this debate is it's a false debate, it's a false debate. This is a convenient trick to try to divide our country more. Most of us in America, including gun owners, agree on things that would stop the kind of carnage that's going on in cities all over America. Let me agree with Grover for a second, all the shootings in my city only one was done by a law-abiding citizen that's mentally stable that bought a gun. I'm not afraid of law-abiding citizens who buy a gun. Buy the guns you want. What the problem is in America right now is that a terrorist person who is on the no-fly list could go into the secondary market today and buy a weapon. We need to shut down these secondary markets. And when you poll NRA members you poll NRA members, 74 percent agree that nobody in America should be able to buy a gun without doing a background check. So let's stop the false debate. STEPHANOPOULOS: Let Matthew go ahead, Katrina. DOWD: Part of what happens, this is so many things in Washington, it's built on myth. And it's not reality. And the NRA and the leadership of the NRA is built on myth. I would not have guessed that anybody who has diminished credibility could get up and do something and diminish their credibility more than what Wayne LaPierre did Friday in his press conference. Average folks like Cory said, is average folks know that you have got to do something about this, they know it's comprehensive. They know this. I live in Texas. I own five guns. And all the folks I associate with when you go out hunting you take your guns and you put them if a safe and everybody goes to bed. It's the Wild West everybody talks about the Wild West, the Wild West, almost every part of the Wild West you checked your guns at the door before you walked in somewhere in a Wild West town is the way it used to be. I worked for Senator Bentsen, who you know and served in your administration. Senator Bentsen represented Texas. He helped pass the assault weapons ban. Though it may not solve the problem, I expected Wayne LaPierre, I actually expected Wayne LaPierre to stand up and say exactly what he said and then say oh by the way I have stuck to too many dogmatic positions for too long and it's time we ban the assault weapons. BOOKER: But his membership agrees with these pragmatic, common sense changes. VANDEN HEUVEL: This is the importance, the NRA is built on myths at this point in many ways. The NRA has 4 million members. It is essentially a lobby for gun manufacturers, not for its members, the majority of them, according to a poll commissioned by Frank Luntz, Republican pollster, do not agree with the NRA's positions on background checks, on ban on assault weapons. I think that's very important, because the NRA's myth has put us in a stranglehold in this country. The other thing I'd say is I respect the noble sentiments about the need to treat mental illness, the need to deal with the video games in our culture, but other western industrialized countries have mental illness problems, have video culture. Japan is at the cutting edge. They don't allow access to military assault-style -- this is not about freedom, this is about tyranny and destruction. VANDEN HEUVEL: The mental illness argument has been used to evade action. More guns and bullets, more dead children. We must, must regulate guns. And I do think it's a tipping point moment, not just The Daily News and The New York Post, but you're seeing pro-NRA senators like Senator Manchin, Senator Warner, Governor Hickenlooper in Colorado, others saying we must move, speed is of the essence. STEPHANOPOULOS: I agree with that. And I think we're just saying that Senator Manchin did say we have to consider everything comprehensively. We should give Grover a chance to respond to some of this now. NORQUIST: I think -- look, the National Rifle Association represents a great number of Americans and 20 percent will tell you in polls that they belong to the NRA. And so one, there's a very important issue, one is we should support the First Amendment as well as the Second Amendment. I'm not quite sure -- some people's suggestions of censorship there worry me. But look, one, we have got to calm down and not take tragedies like this, crimes like this, and use them for political purposes. President Obama has been president for four years. If he thought that some gun control would solve this problem he should have been pushing it four years ago. He didn't. DOWD: When there's a kid in the school yard with a baseball bat,we don't give everybody else baseball bats and say go to deal with it and defend yourself. What we do is we take the baseball bat away from the bad kid or the bully and then we sit down and say what can we do to make sure this doesn't happen -- we've got to take the baseball bat away from the bully. BOOKER: Take domestic violence. Let's look at the data. One out of two women murdered by a gun are being murdered by someone they know. States that have taken the secondary markets and shut them down, they've reduced those murders by 40 percent. It didn't eliminate them. I'm not saying this will solve the problem, but eliminating these secondary markets, which 74 percent of NRA members believe that should be done, so you don't have a terrorist who can't fly on a plane could actually -- stop them from getting guns, this makes a change. STEPHANOPOULOS: Are there any of these -- any of these proposals that everyone here is calling common sense? Do you think the NRA is open to considering any -- any kind of reforms in the wake of this tragedy? NORQUIST: Well, the argument is, look, we ought to do things that work and we ought to not do things that don't work. And we ought to take a look at what has worked. You want to drop the number of murders, you want to drop the number of rapes, you want to drop the number of armed robberies, have more people with concealed carry permits in your state. The data out there is clear. It's been out there for decades now. We know what works, which is allowing honest people to carry guns on themselves. STEPHANOPOULOS: Gun statistics also show that the states that have the more gun regulation and less gun ownership have lower levels of gun violence. BOOKER: ...come from. Look where the guns come from. VANDEN HEUVEL: Other countries, I come back to this. Even individualist countries, you know, like Australia. In 1996, they had a gun rampage. You take the guns out, as Cory said, you begin to take the guns out, you begin to reduce the harm that can done. NOONAN: ...small points, two discreet points. One is, there are many Americans who are very pro-Second Amendment but they are not gun people themselves. I can tell you let me speak for them for a moment. We consider the phrases like assault weapons, semiautomatic, automatic, assault rifles, all of those phrases appear to be terms of art used by people who occasionally are trying to mislead. I wish we could publicly make clear exactly which of these weapons are most dangerous, most unhelpful and most unneeded. We could do that publicly. We can take a week and do that. I wish that would happen. NOONAN: I think someone has to fairly make the point here that Americans have guns, not only because they love the sport, not only because they love hunting, not only because they think it is their right, not only in some cases because they're a little nutty and love guns, they also have guns because they are afraid, they think their society and their culture are very frail and in trouble. They think someday they may be on their own. They want guns to protect themselves and protect their families. I think that has to be respected and not denigrated. VANDEN HEUVEL: So the military assault weapons -- a military assault weapon which can pump 30 to 40 bullets in the face of a kid, that's what we need to protect ourselves in this country? BOOKER: We are having the wrong debate again. BOOKER: Listen to me, the people dying in Chicago, the people dying in Newark are not being done with law-abiding gun owners. We do not need to go after the guns. A law-abiding mentally stable American, that's not America's problem. What's happening in our inner cities -- and this is why I get -- don't wave Chicago, because where are Chicago's guns coming from? We trace the weapons that come into my city. And when residents look to me and they say stop the carnage, Cory, what I say is with the guns we're tracing, I have no power to stop them coming into my city as Rahm does them coming into Chicago. They're coming from places that have free secondary markets where criminals and gun runners so easily buy weapons and pump them into communities like mine where it is easy for a person who is a criminal to get their hands on a gun. BOOKER: Wait a minute, we're finding these weapons on our street more and more. My police director, 25-year professional, has never seen as many automatic weapons that are showing up in my community. And they're not coming from law-abiding citizens, they're coming from the secondary trade. NOONAN: Who is using them? Gang bangers who is using them? Who is killing people? BOOKER: Criminals are killing people, not law abiding gun owners. STEPHANOPOULOS: That is going to have to be the last word today. This has been a terrific debate. Obviously it will continue. Thanks to everyone on the roundtable. Have a good holiday. Whoever is going to stick around and answer your questions to this week's web extra. And when we come back, a look at the White House's Christmas spirit. STEPHANOPOULOS: And now we honor our fellow Americans who serve and sacrifice. This week, the Pentagon released the name of one soldier killed in Afghanistan. And we'll be right back with a holiday thank you. NANCY REAGAN, FIRST LADY: Each year I think it's the prettiest. HILLARY CLINTON, FIRST LADY: It's like a wonderland. LAURA BUSH, FIRST LADY: It's always spectacular every year. MICHELLE OBAMA, FIRST LADY: Welcome to the White House! Pretty cool, huh? BARACK OBAMA, PRESIDENT OF THE UNITED STATES: Every tree from Midland Beach to this Ellipse, and all across the country shine as a beacon of hope for all Americans. I'd like to wish each and every one of you a very Merry Christmas and a peaceful and joyful holiday season. STEPHANOPOULOS: A look back at Christmas in the White House. That is all for us today. Thanks for sharing part of your Sunday with us. Check out World News with David Muir tonight. And before we go, a big thank you to everyone here behind the scenes who brings you This Week every week. Have a happy, safe and blessed Christmas.